Located 186 km. from Arica and 12 km. de Putre, is one of the highest altitude national parks in the world, lying between 3.200 and 6.342 mts. above sea level, with an average altitude of 4.500 mts. It covers an area of 137.833 hectares, including Chilean areas of the Andes and the Altiplano in the far north of the country. It was designated a Forest Reserve in 1965 and in 1970 it was declared a National Park. Because of the altitude, there is rainfall in summer and snow in winter. The average temperature is between 12°C and 20°C during the day and -3°C to -10°C by night. Despite these conditions, the climate is relatively dry. A series of interconnected lakes with water of a striking emerald colour, covering an area of approximately 600 hectares. They were formed by volcanic activity, which trapped water flowing from Chungará Lake to Cotacotani through subterranean passages. 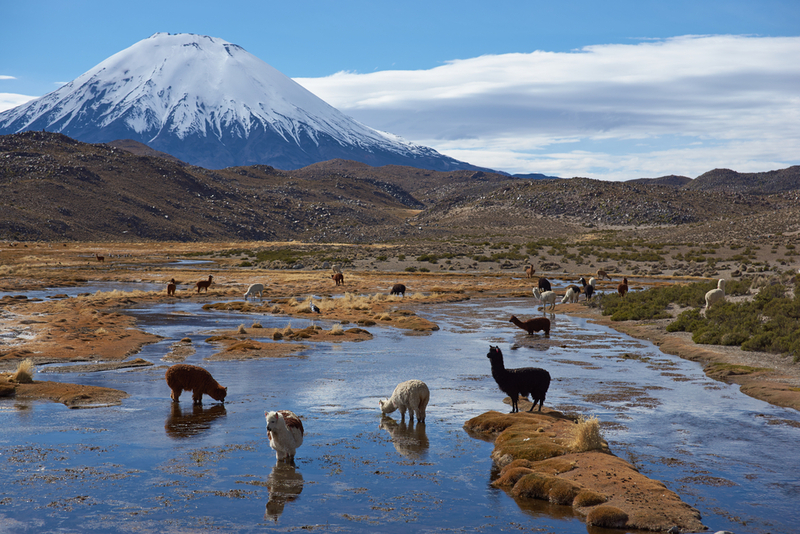 The water flows on, also underground, to the Parinacota marsh, where the Lauca river rises. Covers an area of 2.100 hectares at an altitude of 4.570 mts., making it the highest lake in the world. The waters are emerald green in colour and it is surrounded by snowy peaks including the Parinacota, Sajama, Quisiquisini and, further south, the Quimsachatas, including Guallatiri volcano. There is attractive wildlife and the waters, although cold, are fine for a quick dip. The flora varies with the altitude, as is located in the pre-cordillera and the Altiplano. The first area, located between 3.200 and 3.800 mts., there is low scrub and cactus species such as the candelabra cactus and the tolar, the most typical vegetation of this zone. In protected areas and gullies there are thickets of queñoa and llareta. Above 3.800 mts., in the Altiplano, there are two types of vegetation cover, depending on whether conditions are dry or wet. The predominant vegetation is queñoa de altura and other species such as tuna, llareta, paja brava, chachacoma and bofedal. The latter is a sort of marsh vegetation which only grows above 4.000 mts. altitude. The most striking aspect of the park is the fauna. Larger species include vicuñas, guanacos and huemules or Andean deer. There are also masses of vizcachas among the rocks, and around human settlements, large flocks of llamas and alpacas can be seen. Some 130 species of birds can be observed, the most important being the giant coot, the queltehue de la puna, puna duck, Chilean flamingo etc. The landscape is irregular. There are a number of volcanoes including Parinacota (6.342 mts. ), Pomerape (6.282 mts. ), Guallatiri (6.060 mts.) and Acotango (6.050 mts.). The Altiplano covers most of the central part of the park, and old volcanic calderas can be seen, for example Ajoya and Tejene, as well as lava fields such as Cotacotani. The two principal rivers are the Lauca, which drains the Bofedal de Parinacota, and the Lluta which flows out into the Pacific Ocean. The main lakes are the Cotacotani Lakes, and Chungará, at 4.500 mts. above sea level, being the highest in the world with an area of 21.5 square km. It is still possible to see traces of various features of pre-Colombian cultures. The most important was that of the Inca people, who used to occupy the area. Fossils were found in the area of Las Cuevas, which are thought to be around 9.000 years old. The most important archaeological sites are: the Chungará Tambo, the rocky retreat of Las Cuevas and the Inca Chacus of Las Cuevas. The church at Parinacota is also of great interest, which displays a combination of colonial and indigenous cultures. Furthermore, the village of Chucuyo still consists of straw-thatched houses built of adobe, and the farmlands of Chungará, Ajata and Cruzane exemplify the small territories which were held by a family or ayllu. There are a number of trails in the Park, from which the landscape, the vegetation and the fauna of the pre-cordillera and the Altiplano can be appreciated in all their majesty. One is the Cotacotani Excursion Trail with an extension of 8 km. There are 4 stops on the trail, from which you can see the village of Parinacota, queñoa woods, llareta clumps, marshes, camelid species and geo-morphological phenomena such as the Payachatas volcanoes and the Cotacotani lava field. Another path, named Chungará, runs for 1.000 mts. along the shores of the Chungará lake and has 3 stopping points, offering views of the Payachatas, Quisiquisine and Quimsachatas volcanoes, and a great variety of birdlife such as giant coot, puna duck and white-tufted grebe. Check out the CONAF website for more information about your visit (in spanish only).